a perfectly arranged ceremonial plate filled with symbolic foods to help us recount the miraculous story of our ancestors’ survival. The image of Israelites fleeing reminded me of the Jews constantly moving from one place to another. I thought about the modern Jew who takes off for vacation to enjoy Passover week with his family in sunny places. 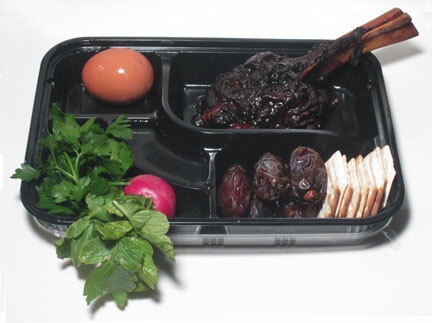 Images of full Seder dinners in take-out trays on airplanes or ordered from a menu online came to mind. I imagined Chinese restaurants taking Passover orders on the phone, delivering dry white rice in white cardboard containers (for Sephardim only! ), or even better, Japanese restaurants delivering ceremonial plates in Bento Box containers (Box A: Egyptian, Box B: Syrian…) all for the constantly moving Jew on the go.